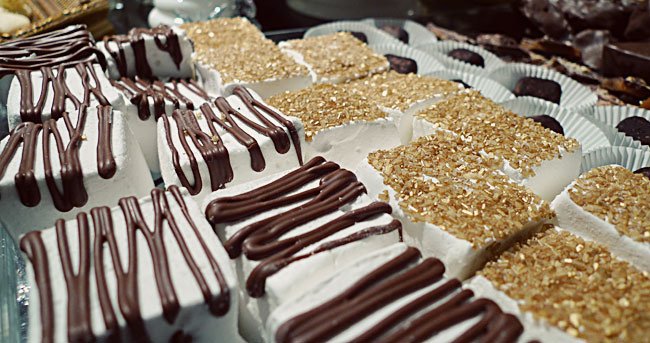 These homemade marshmallows are such a treat for hot chocolate or just by themselves! Wrap them up in a pretty package for an extra-special gift. In a saucepan, combine sugar, hot water, and corn syrup. Cover and bring to a rolling boil. Remove lid, cook to 240 degrees F (use a candy thermometer), stirring occasionally. Soak gelatin in 1/2 c. water in a stand-alone mixer bowl, let sit for 1-2 minutes.Slowly pour cooked mixture over gelatin, beating constantly. Once the mixture begins to thicken, add in vanilla. Beat on high speed for an additional 10-12 minutes, or until the mixture is sticking in the beaters. Pour into a buttered 8" square pan. Let cool uncovered for several hours or overnight. Turn out onto a cutting board that has been dusted with confectioners sugar. Cut into squares with a wet pizza cutter or kitchen shears. Dust all sides in confectioner's sugar, sprinkles, or dip in chocolate. Tip: The cooked mixture will hang around 225 degrees for a while before moving up, the last few degrees will go quickly. Once the temperature gets to around 237, soak the gelatin in the water so that it is ready when the mixture reaches 240.